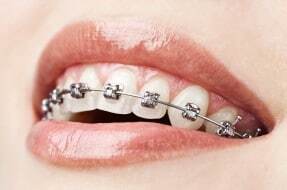 This blog discusses some of the different types of braces and the problems that can occur with braces. With the quest for straight teeth many people opt to have braces to improve or change their smile. However, there are different types of braces available and it is important that oral hygiene is maintained throughout the treatment. It is important that when a brace is fitted, extra care should be taken with oral heath. Wearing a brace can make it more difficult to brush teeth and the advice of the treating practitioner should be taken. It is also important to limit the amount of sugary snacks and drinks. – Damaged teeth as a result of not brushing appropriately. This can take the form of permanent white or brown marks, or in some instances can be severe and teeth may require extraction due to decay. – A relapse, where the teeth return to their original position, this may be because the treatment was too quick or not suitable for that particular patient. – Having to undergo further treatment as certain teeth were not extracted prior to starting the original treatment. For those considering orthodontic work, you should ensure that you seek appropriate advice when deciding to get a brace, and should attend a consultation with an orthodontist or a specialist equipped with the experience and expertise to carry out orthodontic work. A treatment plan should be devised and you should be advised of your options, what the treatment will involve and the cost. If you have suffered problems with a brace, which you feel could have been avoided, please call the Dental Negligence Team who will be happy to assist.